At M&M Lighting in Houston, we’re proud to offer some of the best lighting options throughout Texas. From decorative pendants and chandeliers to outdoor lights and sconces, we carry a wide variety of lighting products to complement any room in your home. 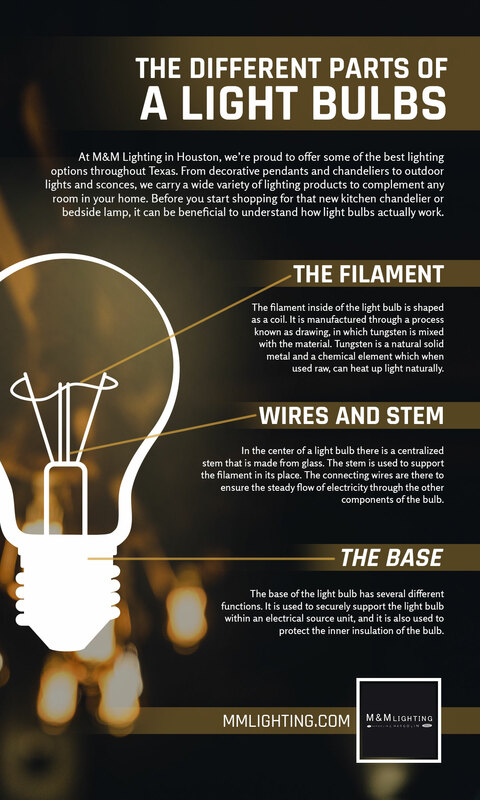 Before you start shopping for that new kitchen chandelier or bedside lamp, it can be beneficial to understand how light bulbs actually work. 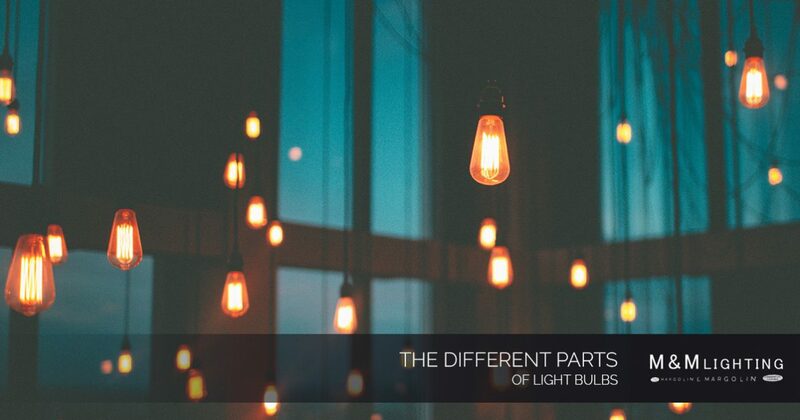 In this blog, we’ll take a closer look at light bulbs and how they function. Before the invention of the light bulb, trying to illuminate the world after the sun went down was a messy and hazardous task. While Thomas Edison is often credited with the invention of the light bulb, this famous American inventor wasn’t the only one who contributed to the development of this revolutionary technology. Let’s take a closer look at how the light bulb came to be. The story of the light bulb began long before Edison patented his first commercially successful bulb in 1879. In 1800, and Italian inventor by the name of Alessandro Volta developed the first practical method of generating electricity, known as the voltaic pile. Created from alternating discs of zinc and copper (interspersed with layers of cardboards that were soaked in salt water), these unique elements conducted electricity when a copper wire was connected at either end. This was actually known as the predecessor of the modern battery, and Volta’s glowing copper wire was considered to be one of the earliest manifestations of incandescent lighting. It wasn’t until 1850 that an English chemist by the name of Joseph Swan developed a light bulb that used carbonized paper filaments in place of other models that were made of platinum. Swan received a patent in the United Kingdom in 1978, and that February he demonstrated a working lamp. Edison realized that the problem with Swan’s design was the filament, and he discovered that a thin filament with a high electrical resistance would make a lamp more practical, as it would require a small amount of current to make it glow. Once Edison revealed this discovery, Swan incorporated these improvements into his light bulbs and founded an electrical lighting company in England. Edison quickly sued for patent infringement, but since Swan’s patent was a strong claim, the two inventors eventually joined forces to form Edison-Swan United. The two inventors went on to become one of the world’s largest manufacturers of light bulbs, according to the Museum of Unnatural Mystery. Light bulbs have a very simple design structure. At the base, they have two metal contacts which connect to the ends of an electrical circuit. These metal contacts are also connected to two stiff wires, which are then attached to a thin metal filament. The filament sits in the middle of the light bulb, and is held up by a glass mount which is filled with an inert gas like argon. When the bulb is connected to a power supply, an electric current flows from one contact to the other. The filament inside of the light bulb is shaped as a coil. It is manufactured through a process known as drawing, in which tungsten is mixed with the material. Tungsten is a natural solid metal and a chemical element which when used raw, can heat up light naturally. In the center of a light bulb there is a centralized stem that is made from glass. The stem is used to support the filament in its place. The connecting wires are there to ensure the steady flow of electricity through the other components of the bulb. The base of the light bulb has four main functions. It’s first job is to securely support the light bulb within an electrical source unit, similar to a lamp or lamp fitting. The second job of the base is to transfer the electricity from the main electrical source unit to the actual bulb itself. In addition to these duties, the base is used to protect the inner insulation of the bulb and to secure all of the components of the bulb itself. As you can see, several working parts must be in order for a light bulb to work. If you’re shopping for new pendant lights, sconces or outdoor lights online, be sure to visit M&M Lighting’s showroom in Houston today!